The internet has transformed the commercial landscape for artists of all kinds. Whether you're a painter, sculptor, photographer, or digital artist, there are more ways than ever to make a great living doing what you love. Online marketplaces have removed a lot of the gatekeepers that used to keep talented artists away from their potential customers, creating a place to sell your artwork online that's open and free. Of course, a big change to any system introduces new challenges, and this one is no exception. With so many other talented artists out there, selling their creations all over the internet, It can be tough to compete for customers. And a big part of your initial business plan is deciding how to find your ideal market, but that's not necessarily an easy task, especially when you have to choose between such a wide range of equally tantalizing options. With all this in mind, we decided to put this article together, exploring a few of the more interesting online platforms for selling art, in the hopes of giving you a basic overview of what's out there. This site has been around forever, and it's still going strong. They offer a great platform for visual artists to sell art online free, adding their creations to various types of merchandise, like shirts, mugs, or hats. You can set up your own custom shop here, and put your designs on up to 250 different types of products. If you want to succeed in a big way with a CafePress shop, you'll have to do your own marketing, and there's tons of established competition out there already. Consequently, the money may not start flowing in right away, and for many folks this will probably end up being more of a side gig. But even if it doesn't make you rich, it's very easy to set everything up on the site, and it can be a good way to get your feet wet in the world of online art sales. You can read our CafePress review to learn more, or go here to sign up. This is one of the best known sales platforms on the internet, and they cater specifically to creatives of all kinds, including artists. You can sell anything you can imagine here, from paintings, to photographs, to sculptures. Some categories are obviously more popular than others, and you'll have to build a reputation before you can start making good money, but if you have the skills you might do really well. While researching this article, I did a quick perusal of the paintings currently available, and found people getting sales across a wide range of price points. Some artists offer their paintings for less than 20 bucks each, while others are charging closer to 1000. I also found a few sellers who make very good money doing custom art on demand, such as personal portraits. Overall, it seems like there's a big market for all kinds of creative work here, and it might be well worth you time to check it out. You can read our Etsy review to learn more, or go here to get started on the site. This freelance site is huge these days. There are tons of people making money there doing all kinds of work, and art is no exception. During my research I found people selling line art drawings, book covers, paintings, digital art for video games, and custom photographs. The biggest thing that sets Fiver apart from most other sites mentioned in this article is the focus on commissioned work for client-specific needs. Most people come to Fiver because they want something very particular that they can't create themselves, and you'll make the most money by using your talents to give them exactly what they want in a short amount of time with minimal fuss. For the best results, you'll need to be quick, and adaptable. Plus you'll need to brush up on your communication skills for dealing with clients in a way that minimizes misunderstandings. You can check out our Fiverr review to learn more, or go here to sign up on Fiverr. This site is much more exclusive than the others mentioned above, and the focus is on fine-art rather than commercial art. If you want to sell fine art online here, you have to go through a fairly rigorous approval process where you submit photographs of your work for review, and answer questions about yourself. The fact that it's harder to get in means that you'll probably have less competition, and the focus on fine art means you're able to reach a very specific clientele that might not be easy to find on other sites. The average prices here also tend to be much higher than most of the more open marketplaces. Go here to check out Artfinder. This service is similar to Artfinder in terms of targeting customers in the market for fine artworks, but it's not so difficult to get accepted there. They will let you set up your own custom shop on their website for free, and they pay your shipping fees. You'll have to give them a 30% commission on all sales, but the minimum price seems to be $500.00, which is a lot higher than any other site mentioned here. Overall Saatchi looks like a good choice for those looking to get a premium price for high-end work. Go here to check out Saatchi Art. The above sites are just a small sampling of the many internet marketplaces available to talented artists. And it's important to remember that you don't have to choose just one. Like many other online businesses, focusing on a wide variety of marketplaces can be an effective strategy. For example, you could offer your services as a portrait painter on Fiverr, while simultaneously selling your more personal creations on sites like Artfinder and Saatchi. The exposure derived from getting your name out there in a lot of different places can lead to unexpected opportunities, such as high-dollar commissioned work. 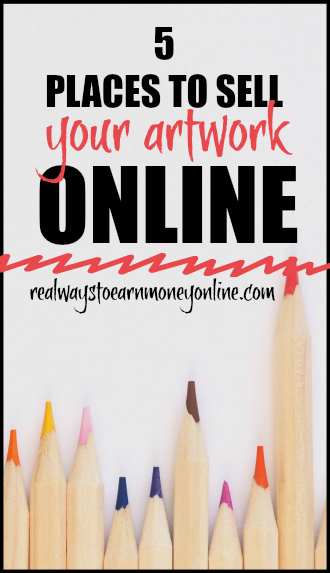 If you want more info on how to sell art online and make money, we have another list with places to make money off your art here. P.S. – Interested in another way to earn a living selling stuff online?